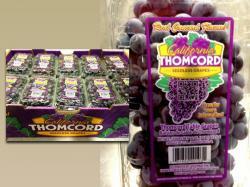 Farmers Fresh Fruit Company has redesigned their label for their California Thomcord Variety. The design is focused on the California Thomcord brand and a custom designed QR code. “We wanted the Quick Response code to be placed in a way that makes it easy to see and convenient for consumers to scan.” says Shane Souza, Vice President of Sales. The QR code will direct consumers to information about the seedless grape variety including recipes, nutritional information and more. The QR code design, by MC Solutions, involves the code embedded into a bunch of grapes, incorporated with the brand logo. This gives the label an element of creativity and fun while staying true to the brand.